At least 35 people were killed when a motorway bridge collapsed in torrential rains on Tuesday morning over buildings in the northern Italian port city of Genoa, Italy's ANSA news agency cited fire brigade sources as saying. A 50-meter high section of the bridge, including one set of the supports that tower above it, crashed down in the rain onto the roof of a factory and other buildings, crushing vehicles below and plunging huge slabs of reinforced concrete into the nearby riverbed. Click here for a graphic of the Italy bridge collapse. Within hours of the disaster, the anti-establishment government — which took office in June — said it showed Italy needed to spend more to improve its dilapidated infrastructure, ignoring EU budget constraints if necessary. "We should ask ourselves whether respecting these [budget] limits is more important than the safety of Italian citizens. Obviously for me it is not," said deputy Prime Minister Matteo Salvini, who leads the right-wing League which governs with the 5-Star Movement. Helicopter footage on social media showed trucks and cars stranded on either side of the 80-meter long collapsed section of the Morandi Bridge, built on the A10 toll motorway in the late 1960s. One truck was shown just meters away from the broken end of the bridge. A motorway bridge collapsed in the northern Italian port city of Genoa, killing at least 22 people, according to officials. 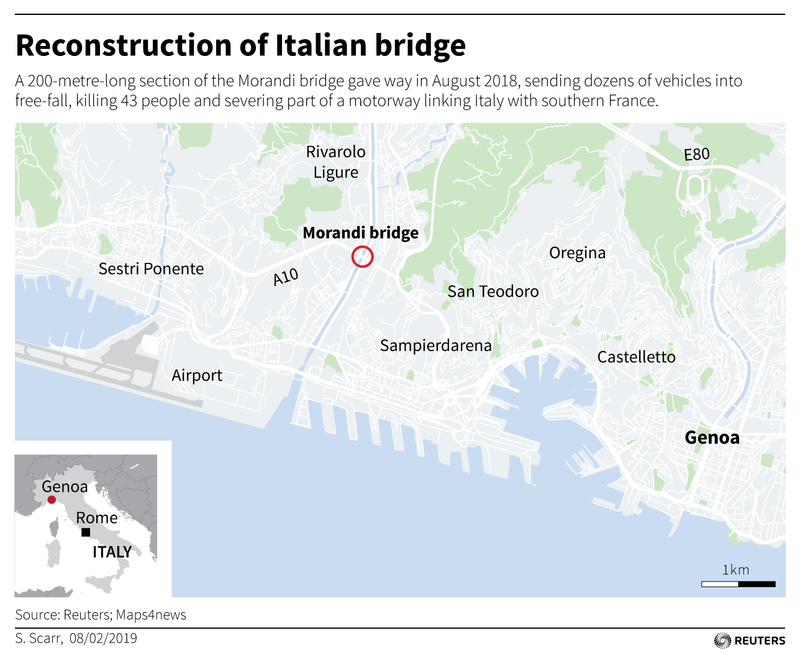 But Stefano Marigliani, the motorway operator Autostrade's official responsible for the Genoa area, told Reuters the bridge was "constantly monitored and supervised well beyond what the law required." Restructuring work was carried out in 2016 on the 1.2 km-long bridge (about .75 miles), first completed in 1967. The motorway is a major artery to the Italian Riviera and to France's southern coast. "The tragic facts in Genoa remind us of the public investments that we so badly need," said Claudio Borghi, the League's economy spokesman.